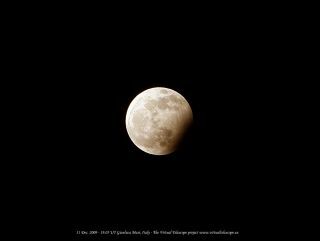 Gianluca Masi of Italy photographed the partial lunar eclipse and blue moon (the second full moon of the month) on New Year's Eve, Dec. 31, 2009. The blue moon on New Year's Eve, 2009, offered up a partial lunar eclipse for some lucky skywatchers. People in Europe, Africa, and Asia who had clear skies overnight were able to see a distinct scallop of shadow on the moon as Earth got between the sun and the moon, blocking some of the light that normally illuminates the moon. Gianluca Masi of Italy took an eclipse image as part of the Virtual Telescope Project. It was not visible from North America, except for northern Alaska and northernmost Canada. The full moon was the second one of the month of December, thus earning the name of blue moon, due to an interesting mistake by a magazine writer decades ago. The moon was not blue. The last time a blue moon occurred New Year's Eve was in 1990. The next one will be in 2028. "For those living in central and eastern Asia, as well as Australia and New Zealand, that same full moon occurs after midnight, on the calendar date of Jan. 1, 2010. So in these regions of world, this will not be second of two full moons in December 2009, but the first of two full moons in January 2010. So, if (for example) you live Perth or Tokyo, you'll have to wait until January 30 to declare that the moon is 'officially' blue."